If anybody ever ask me to mention a traditional Catalan dish, I would say “Calçots” without hesitation. 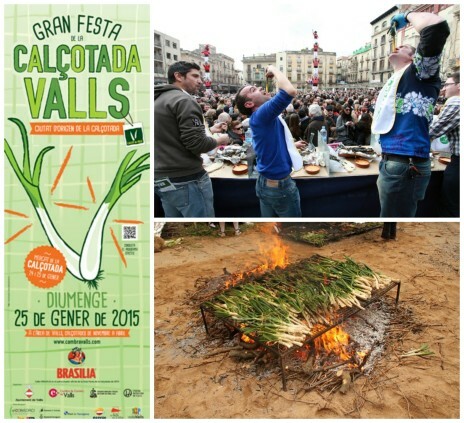 Calçots are milder and less bulbous than onions.This weekend we will celebrate the 34th edition of Fiesta de la Calçotada de Valls (Spring Onion Festival). I know sometimes it’s better to discover new experiences by your own. However, some local events require some know-how/contacts, and it’s better to reserve a tour, so you enjoy all the insights of the festival. A great option is LivingIt, an agency focus on traditional events and local festivals in Catalunya. If you decide to visit the festival by your own, make sure you get there early (before 10 a.m.) to make the most of your visit. There are trains coming to Valls from Barcelona Sants Station. There will be plenty of contests and activities, so as soon as you arrive, go to get your tickets at the City Hall and get prepare to live a unique traditional experience. If you are looking for accommodation in Barcelona, don’t miss our special offers for this weekend. Apartments in the city center from 36€ per person/per night.